This mission style inspired piece will make anyone feel at home. The authentic rustic brown finish, plank board composition and open floating tenon joinery are beautifully crafted for any space whether its located at a cabin or for your living room. The cocktail table features a open shelf and a lift-top perfect for adapting to any needs you may have in the living room. 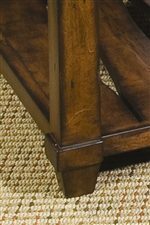 Pair with the end table, chairside table, and console table for a complete rustic style living room. The Tacoma Rectangular Mission Lift-Top Cocktail Table by Hammary at Jordan's Home Furnishings in the New Minas, Halifax, and Canning, Nova Scotia area. Product availability may vary. Contact us for the most current availability on this product. Create an authentic and inviting atmosphere for your home with the Tacoma Collection. 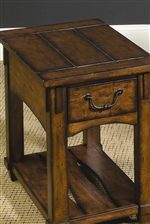 Consisting of four items including a lift-top cocktail table, end table, chairside table, and console table, these pieces are the epitome of mission style design. 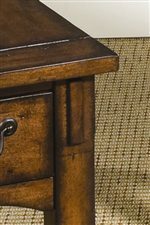 The plank boards, exposed open floating tenon joinery, and general weathered look of the rustic brown finish come together to produce a very mission inspired occasional table collection allowing anyone to feel invited and at home in their living room. The Tacoma collection is a great option if you are looking for Mission furniture in the New Minas, Halifax, and Canning, Nova Scotia area. Browse other items in the Tacoma collection from Jordan's Home Furnishings in the New Minas, Halifax, and Canning, Nova Scotia area.